The popular ITV series is action packed with challenges and games, but one of the highlights is an interactive celebrity feature called ‘The End of The Show Show’. 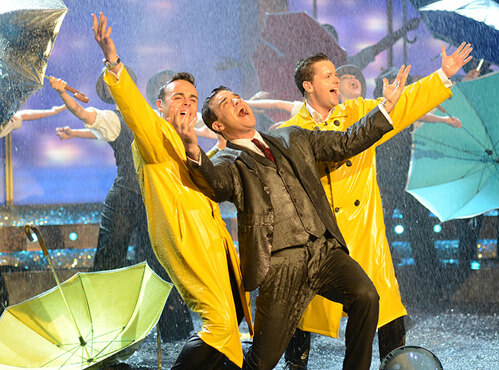 The task for Ant and Dec was to perform Singing in the Rain with Robbie Williams, and you can’t do that properly without any water, so ITV called us in. The main challenge with most Rain Effects jobs is actually catching the water, especially on Live TV when you have very limited time to construct a catchment tank. We had only 3 minutes during the Ad break to get everything into position. We used a round tank with a flexible side wall which could be folded down. It was quickly moved into place and then expanded to create a large diameter circle. A liner was then placed inside the circle and folded out, then up and over the side wall before a decorative stone effect surround was placed over the top. A few hundred litres of water were then pumped in to fill the bottom of the tank to give it the feel of a puddle filled street. The rain nozzles had been pre-rigged in the ceiling of the studio and were lowered into position. We’d need not have worried about containing all the water in the tank. Ant Dec and Robbie had such a fun time splashing around that they soaked the studio anyway. Especially with the final shot which culminated in two buckets of water being thrown simultaneously over Robbie’s head. The Rain Effects looked amazing! You can watch the video here.